WASHINGTON (AP) — She’s cooked bean soup live and done laundry in public. She narrated much of what she calls “Congress camp” on Capitol Hill. We know what’s in her bank account — less than $7,000 — and what she thinks of reviews of her clothing. Such intimate details have kept Alexandria Ocasio-Cortez’s star on the rise since she upset Democratic veteran Joe Crowley in New York’s June primary. By the time she takes her seat in the House on Jan. 3 as the youngest woman ever elected to Congress, the 29-year-old Ocasio-Cortez will have blazed a new, more public trail to Washington and literally shed light on the maze of Capitol Hill. “Guys there are secret underground tunnels between all of these government buildings,” she mock-whispers in one social media post. In her first week, Ocasio-Cortez, a democratic socialist, did give a glimpse inside the power games of Congress when she appeared with protesters in the office of the woman fighting to become House speaker, Nancy Pelosi of California. Pelosi, who had not yet won Ocasio-Cortez’s support in the leadership fight, permitted the demonstration. Video of the event was posted to social media. Over the weekend, Ocasio-Cortez signaled she would vote for Pelosi for speaker. That episode and others offered clues to how Ocasio-Cortez and her social media practices fit into a national legislature that’s slowly becoming younger, less male and more diverse. The approach Ocasio-Cortez is modeling — and the political world is studying — gives her a measure of control by communicating directly with constituents and responding to critics in close to real time. The Ocasio-Cortez approach carries risks. Every word she utters and writes will be scrutinized in the big arena of Congress and the 2020 re-election campaigns that have effectively already begun. Fact checkers pounced. Employed people are only counted once when the unemployment rate is determined — no matter how many jobs they hold. And the percentage of people working multiple jobs has fallen slightly since the mid-2000s, according to the Bureau of Labor Statistics. There have been other tangles. “People keep giving me directions to the spouse and intern events instead of the ones for members of Congress,” Ocasio-Cortez tweeted Nov. 14. Her high profile has come with criticism. Conservatives, too, questioned her claim that she can’t pay rent in pricey Washington. A spokesman for Ocasio-Cortez said Tuesday that she has less than $7,000 in her bank account to get her through the first congressional payday in January. She and each rank-and-file member will make $174,000 a year. 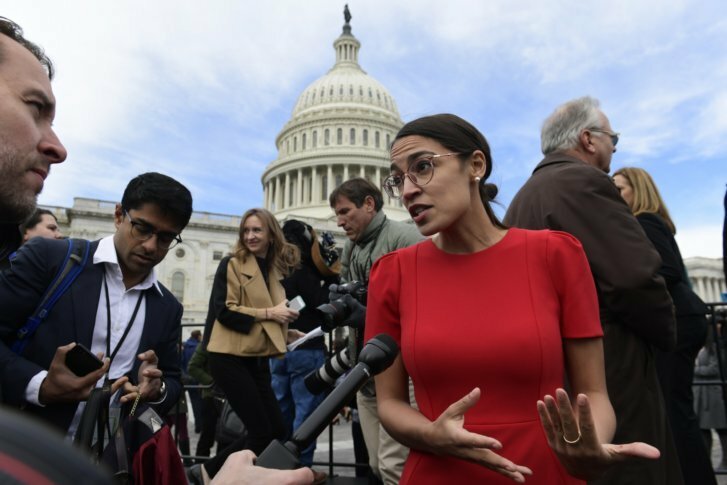 Another spat ensued when Ocasio-Cortez misspoke and referred to “three chambers of government,” rather than three branches. Former Alaska Gov. Sarah Palin, a Republican not immune to gaffes herself as John McCain’s 2008 vice presidential running mate, tweeted that the congresswoman-elect had fumbled basic civics. For now, Ocasio-Cortez posted that her appearance Monday night will be the last “before we go dark” to set up two congressional offices — one in New York and one in Washington. But even that announcement raised questions among her followers. “Don’t worry, I’ll still be on insta, twitter, etc.,” she reassured them. Associated Press writer Josh Boak contributed to this report.